Recurrent cancer per smoking, metastisized. James Benjamin Blish acheived fame all over the world as one of the "founding fathers" of the Science Fiction community. He helped to found the Science Fiction Writers of America (SFWA) and was published in many languages. During his career he received Science Fiction's top award, the Hugo Award, as well as many other lesser honors. After his death, an award for criticism was created in his name. The first winner of the James Blish award was Brian Aldiss, in 1977. On July 5th, 2002, James Blish was posthumously inducted into the Science Fiction and Fantasy Hall of Fame. From the perspective of this writer (the son of James Blish), Professor Ketterer's account treats James Blishes life with somewhat of a more negative view than it deserves. The impression is gathered, when reading this title, that James Blish was not a happy man. Yet I definitely recall many bright smiles, laughter, and a sharp sense of humor, reports of which seem to be uniformly lacking in this volume. Still, you are unlikely to find such a wealth of information about my father anywhere else, and I do find the volume definitely worth reading. I only ask that you do keep in mind that he certainly did have a happy side to his life, no matter that Ketterer fails to portray it with any significance. Here is James Blishes very first appearance in print, anywhere, in the letters section of Astounding Stories, at the tender age of 11 years old. This appeared in the readers comments section for the September 1932 issue. Good work on Astonishing Stories. "The Lifestone" and "Asteroid" were expert jobs, the others not down to 10c standard but not as good as these two by wide margins. Cover very good, interiors all a little crude except the one illustrating "Half-Breed". Where is Leo Morey now? He is not as good as he used to be, but he's better than anybody you have but Eron. Or get Binder to do some more interiors. I hope that before you print another letter like "4E's" (whoever he may be) you will take steps to make it readable. Illiteracy is unpardonable, but such an obviously deliberate attempt at artificial illiteracy is in bad taste and ought to be corrected rather carefully or not printed at all. Congrats, and I hope Super Science Stories is as good, despite the handicap of a story by me. -- Jim Blish, 12 Washington Terrace, East Orange, New Jersey. One of the science fiction writers I read as a teenager was named James Blish. The visions he scattered across the pages of the science fiction magazines included a popular series of stories in which the cities of Earth acquired domes and anti-gravity motors and became giant spaceships that roamed the galaxy. Jim wrote a lot of other things beside the Cities in Flight series and one of them generated an anecdote that has become a permanent component of my personal life support system. It is an incident that sums up, I think, part of the connection between the boy who sat at his work table building model airplanes and the slightly older boy who sits at his desk putting words on a computer screen. One of Jim's short stories was based on some real research in some aspect of psychology such as the chemistry of memory. Years ago, at a science fiction convention in Philadelphia, he came up to me with his face glowing with excitement. He had just been approached by a young woman who had come to the convention because she had seen an advertisement that announced he would be there. She had read his story when she had been a girl and she had been so fascinated by the ideas in it that she had looked up the research the story had been based on and acquired a permanent interest in psychology. She had come to the convention because she had wanted him to know she had just received her Ph.D. in psychology. She had even brought him something to autograph-- a copy of the original scientific paper that described the research he had used in his story. I had no trouble understanding why Jim looked so ecstatic. I've always been glad he told me about that encounter. It's the kind of memory I pull out of my organic data banks whenever I wonder why any sane person should spend his life tapping out sentences on a keyboard. It isn't the most important reason writers write, but it's important enough. I probably wouldn't want to read very many words by any writer who didn't light up when something like that happened. He had sent copies of his story sailing through the world like paper airplanes and one of them had landed in the mind of a young girl. And she had flown. James Blish coined the now commonly used astronomical phrase "Gas Giant"
The following is the obituary that appeared in The New York Times on Thursday, July 31, 1975. LONDON, July 30 - James Blish, the science fiction writer, died today in his home at Henley-on-Thames, Oxfordshire, after a long illness. He was 54 years old. Mr. Blish leaves a wife, the former Judy Ann Lawrence, an artist and writer, and a son by his earlier marriage to Virginia Kidd. Mr. Blish's best known works included Fallen Star, Titan's Daughter, and A Torrent of Faces with Norman Knight. Others were Jack of Eagles, Earthman Come Home, The Frozen Year, A Case of Conscience, Galactic Cluster, Dr. Miribilis and Black Easter. 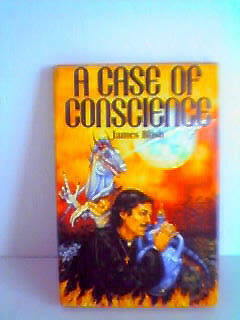 He also wrote There Shall be no Darkness, a novel about witches included with other stories in Witches Three. Of Mr. Blish's novel about witches a reviewer in The New York Times commented that the omnibus was "one more proof that science fiction is really growing up." Anatole Broyard, reviewing Dr. Miribilis in The New York Times, remarked that the book, a study of Roger Bacon, the 13th century scientist and philosopher, was based on a massive study of the man, his age, his thought, his books (more than 22 tomes) and the lives and works of his contemporaries Albertus Magnus, the scholastic, and Thomas Aquinas, the philospoher. Mr. Broyard added: "A highly regarded science-fiction writer, the author is a passionate medievalist as well, and this book is obviously a labor of love. If love is not blind, it is at least partial, and Mr. Blish elevates Bacon at the expense of Albertus and Aquinas." Of Earthman Come Home, a reviewer in The Times Book Review said it "surpasses even the high Blish standards, and offers that very rare thing, a wholly new concept of the far future." 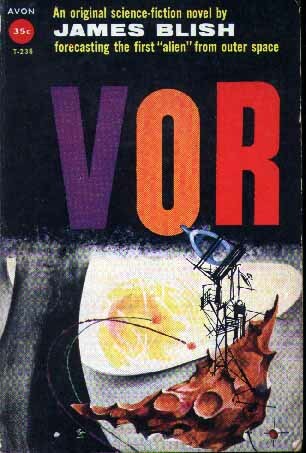 The novel depicted vagabond cities wandering in space, with New York City as the "hero," roaming through the galaxy long after it had cut loose from its home planet. 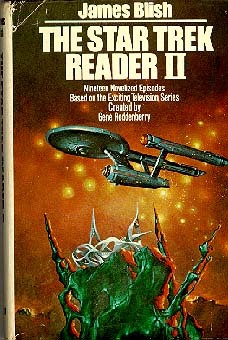 Mr. Blish also wrote several books of poetry and had written Star Trek, based on the NBC-TV series created by Gene Roddenberry. He was born in Orange, N.J. in 1921, and moved to England in 1968.